I have a tag share for you today. This tag I made for Tag You’re It Challenge #23. Here is the inspiration tag for the challenge. This is Tracey’s tags. So adorable. What inspired me is the banner tag and the red die cut element on the tags. So keeping those in mind, here is my take on the challenge. The banner die cut is from Pretty Pink Posh’s Stitched Banner Duo die set. I die cut one using vellum cardstock and one using white cardstock. The bird die is called Flight of Fancy from Penny Black. I die cut three using white cardstock, then coloured with three different shades of red Copic markers. I used R32, R24 and R37. Hex chart was very useful to pick the colours. I then glued them slightly offset to each other. Love the ombre of birds here. This ombre cluster is adhered to the vellum cardstock using foam adhesive for dimension. The sentiment is from Pretty Petals stamp set from Penny Black. I simply stamped in black ink and heat embossed using clear embossing powder. I layered the two banner die cuts, punched couple of holes and threaded some black twine. Finally the birdies received some shimmer using Wink of Stella pen. I am also submitting this tag for Virginia’s View Ombre Challenge. Here are the two Penny Black products I have used to make my tags. 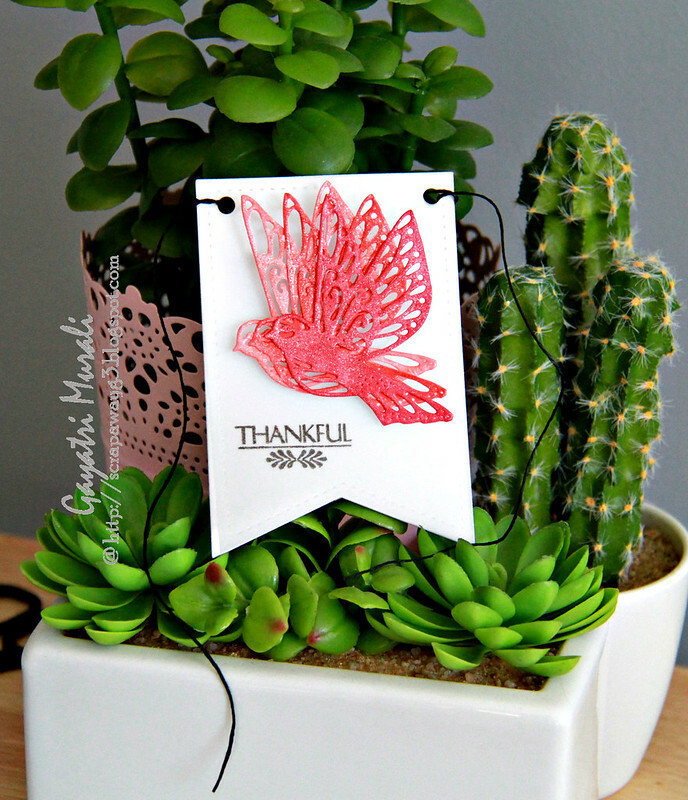 I love the motion you captured with that bird die cut! Wonderful Gayatri! Your layered die cuts created so much movement, this is fabulous!